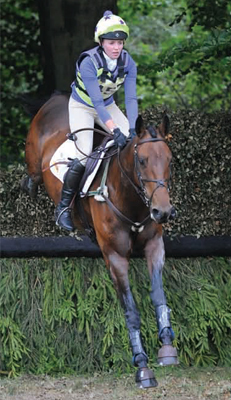 Thank you so much to Blue Chip for sponsoring the Ex-Racehorse category of the South East Eventers League. As a committee member I see all the behind scenes work that goes on and it can be difficult to obtain sponsorship for the league and it is great that Blue Chip stepped in at the last minute with sponsorship. I was placed 2nd in the category with Elspeth Appleby’s mare Cinderbanks. Elspeth was over the moon with her prizes, thank you again. I had a successful season with Cinderbanks riding and schooling her whilst Elspeth was pregnant. Winter has now set in and so it’s the end of the eventing season, I’ve got a few more horses on the yard so hoping to have them out on the circuit next season! I have a TB called Woody, he’s just backed, also Juno a 3 year old Mare and JJ a 6 year old gelding. I’m also hoping to back Lola my coloured mare next year – she’ll be 3. Lady is in work and I am going to the Riding Club Area dressage competition on the 4th, it’s a team qualifier for Hartpury. Planning to do SJ, hunting & dressage over the winter. The post A Thank You From Lisa Pilbeam appeared first on Blue Chip Feed | Horse Supplements & Horse Feed Balancers.